These 25mm black blades are very sharp. Cuts through anything. 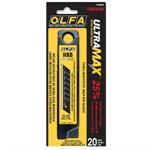 Olfa 25mm Extra Heavy Duty UltraMax Blades, HBB-20B, 20 Blades/pack. High quality blade with superior edge retention for your toughest jobs! 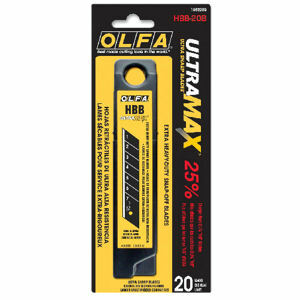 Olfa Long lasting Ultramax durable snap-off blade - a new sharp edge with each snap. This blade fits OLFA Extra Heavy-Duty Utility Knives. 7 cutting edges per blade. 20 blades per pack. 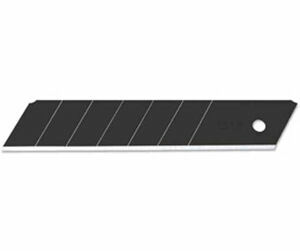 These heavy-duty blades are designed for more demanding materials and projects. Use these blades for cutting industrial materials such as gaskets, conduit, belt synthetics, rope, leather, laminates, plastics, fiberglass, rubber and textiles. (HBB-20B, #1082209). Call us to discuss quantity pricing.